We recently reported that the C2AB portion of Synaptotagmin 1 (Syt1) could self-assemble into Ca2+-sensitive ring-like oligomers on membranes, which could potentially regulate neurotransmitter release. Here we report that analogous ring-like oligomers assemble from the C2AB domains of other Syt isoforms (Syt2, Syt7, Syt9) as well as related C2 domain containing protein, Doc2B and extended Synaptotagmins (E-Syts). Evidently, circular oligomerization is a general and conserved structural aspect of many C2 domain proteins, including Synaptotagmins. Further, using electron microscopy combined with targeted mutations, we show that under physiologically relevant conditions, both the Syt1 ring assembly and its rapid disruption by Ca2+ involve the well-established functional surfaces on the C2B domain that are important for synaptic transmission. Our data suggests that ring formation may be triggered at an early step in synaptic vesicle docking and positions Syt1 to synchronize neurotransmitter release to Ca2+ influx. Reliable communication between neurons is essential for the brain to work properly. This is accomplished by tightly controlling how chemical messengers, called neurotransmitters, move between neurons. Neurotransmitters are typically packaged into bubble-like structures called synaptic vesicles and are released only when the neuron receives an input electrical signal. A set of proteins orchestrates the release of the neurotransmitters from the neuron, which happens after the synaptic vesicles fuse with the cell membrane. Synaptotagmin, a protein found on the surface of the synaptic vesicle, plays many roles in neurotransmitter release. It helps to attach the synaptic vesicle to the cell membrane and also prevents the vesicles from fusing to the membrane in the absence of an appropriate input signal. Most importantly, it detects when the electrical signal arrives at the neuron by binding to calcium ions that flood the cell following the input signal. This triggers the rapid fusion of the vesicles to the cell membrane. It is not clear how Synaptotagmin is able to carry out its different roles and in particular, control how neurotransmitters are released as calcium ions enter the cell. Zanetti et al. have now used a technique called negative stain electron microscopy to investigate how Synaptotagmin molecules taken from mammals arrange themselves on the surface of a membrane. In this technique, individual Synaptotagmin proteins on the surface of a synthetic membrane are chemically marked and their structure is imaged using an electron beam. Using this approach under conditions resembling those in cells, Zanetti et al. found that 15–20 copies of Synaptotagmin came together and formed ring-like structures on the membrane surface. These ring structures were rapidly broken apart when calcium ions were added to them. Further investigations suggest that the ring structures form when synaptic vesicles first attach to a membrane. Overall, it appears that the Synaptotagmin rings act as washers or spacers to prevent the vesicle from fusing to the cell membrane until the rings are disrupted by the arrival of calcium ions. Future studies are now needed to investigate whether the ring structures form inside cells and whether they act together with other proteins involved in neurotransmitter release. Synchronized rapid release of neurotransmitters at the synapse is a highly orchestrated cellular process. This involves maintaining a pool of synaptic vesicles (SV) containing neurotransmitters docked at the pre-synaptic membrane, ready to fuse and release their contents upon the influx of calcium ions (Ca2+) following an action potential, while also preventing the spontaneous fusion of SVs in absence of the appropriate cue (Südhof and Rothman, 2009; Jahn and Fasshauer, 2012; Südhof, 2013; Rizo and Xu, 2015). The core machinery required for the Ca2+ triggered neurotransmitter release are the SNARE proteins (VAMP2, Syntaxin, and SNAP25) as well as Munc13, Munc18, Complexin and Synaptotagmin (Südhof and Rothman, 2009; Jahn and Fasshauer, 2012; Südhof, 2013; Rizo and Xu, 2015). A combination of biochemical, genetic and physiological results have pinpointed Synaptotagmin as a central component involved in every step of this coordinated process (Wang et al., 2011; Jahn and Fasshauer, 2012; Südhof, 2013; Rizo and Xu, 2015). The principal neuronal isoform, Synaptotagmin 1 (Syt1), is a SV-associated protein, with a cytosolic domain consisting of tandem Ca2+-binding C2 domains (C2A and C2B) attached to the membrane via a juxtamembrane ‘linker’ domain (Brose et al., 1992; Takamori et al., 2006). Accordingly, Syt1 acts as the immediate and principal Ca2+ sensor that triggers the rapid and synchronous release of neurotransmitters following an action potential (Brose et al., 1992; Geppert et al., 1994; Fernández-Chacón et al., 2001). Upon Ca2+ binding, the adjacent aliphatic surface loops on each of the C2 domains partially insert into the membrane and this enables the SNAREs to complete membrane fusion by mechanisms that are still uncertain (Tucker et al., 2004; Rhee et al., 2005; Hui et al., 2006; Paddock et al., 2011). Syt1 is also needed for the initial stage of close docking of SVs to the plasma membrane (PM), requiring in particular the interaction of the polybasic region on C2B domain with the anionic lipid, phosphatidylinositol 4, 5-bisphosphate (PIP2) at the PM (Bai et al., 2004; Wang et al., 2011; Parisotto et al., 2012; Park et al., 2012; Honigmann et al., 2013; Lai et al., 2015). The C2B domain also binds to the neuronal t-SNAREs (Syntaxin/ SNAP25) on the PM, which positions the Syt1 on the pre-fusion SNARE complexes and contributes to the docking of the SV but is by itself insufficient (de Wit et al., 2009; Parisotto et al., 2012; Mohrmann et al., 2013; Kedar et al., 2015; Park et al., 2015; Zhou et al., 2015). Despite a wealth of information on Syt1 function and underlying molecular mechanism, critical questions remain. Deletion (or mutations) of Syt1 eliminates fast synchronous release and increases the normally small rate of asynchronous/spontaneous release (Geppert et al., 1994; Littleton et al., 1994; Bacaj et al., 2013). Reciprocally, removing Complexin increases the spontaneous release amount and the remaining Syt1 is only capable of mounting asynchronous release, though this release is still Ca2+-dependent (Huntwork and Littleton, 2007; Hobson et al., 2011; Jorquera et al., 2012; Cho et al., 2014; Trimbuch and Rosenmund, 2016). This suggests that Syt1, acting in concert with Complexin, also functions as a clamp to both restrain and energize membrane fusion to permit rapid and synchronous release (Giraudo et al., 2006; Krishnakumar et al., 2011; Kümmel et al., 2011). How this clamping is accomplished still remains a mystery. In addition, fast neurotransmitter release exhibits a steep cooperative dependency on Ca2+ concentration, which implies that several Ca2+ ions need to be bound to one or more Syt1 molecules to trigger release (Schneggenburger and Neher, 2000, 2005; Matveev et al., 2011). Further, reduced Ca2+ binding affinity does not change this Ca2+ cooperativity (Striegel et al., 2012), suggesting multiple copies of Syt1 molecules might be involved in gating release. However, the exact mechanism of the cooperative triggering of SV fusion is unclear. We have recently shown that Syt1 C2AB domains can form Ca2+-sensitive ring-like oligomers on phosphatidylcholine (PC)/phosphatidylserine (PS) lipid surfaces (Wang et al., 2014). This finding suggests a simple and elegant mechanism: If these Syt1 ring-like oligomers were to form at the interface between SVs and the plasma membrane, they could act sterically to prevent fusion, until this barrier is removed when Ca2+ enters and triggers ring disassembly i.e. the Syt1 ring would synchronize fusion to Ca2+ influx. In addition, the oligomeric nature of Syt1 could explain the observed Ca2+ cooperativity of neurotransmitter release. Here we show that the ring-like oligomer is a common structural feature of the C2 domain containing protein and describe the physiological correlates of the Syt1 ring oligomer which argues for a functional role for the Syt1 ring in orchestrating the synchronous neurotransmitter release. We had previously described the formation of Ca2+-sensitive ring-like oligomers on lipid monolayers with the C2AB domain of Syt1 (Wang et al., 2014). To explore this further, we analyzed the organization of membrane bound C2AB domains of other neuronal isoforms of Synaptotagmin (Syt2, Syt7 and Syt9) on lipid surface under Ca2+-free conditions by negative stain electron microscopy (EM). Syt2 and Syt9 act as Ca2+ sensors for synchronous SV exocytosis but are expressed in only a subset of neurons (Xu et al., 2007), while Syt7 has been posited to mediate the Ca2+-dependent asynchronous neurotransmitter release (Bacaj et al., 2013). EM analysis on lipid monolayer was carried out as described previously (Wang et al., 2014). Briefly, the lipid monolayer formed at the air/water interface was recovered on a carbon-coated EM grid and protein solution was added to the lipid monolayer under Ca2+-free conditions (1 mM EDTA) and incubated for 1 min at 37°C. Negative-stain analysis revealed the presence of ring-like oligomers for all the Syt isoforms tested (Figure 1). Despite the variability in the number of ring-like structures between different isoforms, the size of the ring oligomers were remarkably similar, with an average outer diameter of ~30 nm (Figure 1). In all cases, each ring was composed of an outer protein band of a width of ~55Å, which is consistent with the dimensions of a single C2AB domain (Fuson et al., 2007). This data shows that the ability to form the circular oligomers is not unique to Syt1, but conserved among the Syt isoforms and further suggests that it might be an intrinsic property of the C2 domains. Ring-like oligomers are a common structural feature of C2 domain proteins. EM analysis showing the C2AB domains of neuronal isoforms of Syt, namely Syt1, Syt2, Syt7, and Syt9 form ring like oligomers on monolayers under Ca2+-free conditions. Similar ring-like structures were observed for other related C2 domain proteins, like Doc2B and E-Syt 1 & 2. The number of ring-oligomers observed on the monolayers varied, but the dimensions of the rings were remarkably consistent (~30 nm). All EM analyses were carried out using 5 µM protein on monolayer containing 40% PS and buffer containing 15 mM KCl and 1 mM free Mg2+. Representative micrographs and average values, along with standard error of the means (SEM) from a minimum of three independent trials are included. Therefore, we next tested the C2AB domains of Doc2B, C2ABCDE domains of extended Synaptotagmin 1 (E-Syt1) and the C2ABC domains of E-Syt2. Doc2B is a C2 domain protein expressed in the pre-synaptic terminals and a putative Ca2+ sensor that regulates both spontaneous (Groffen et al., 2010) and asynchronous release (Yao et al., 2011). E-Syts are endoplasmic reticulum (ER) resident proteins, which contain multiple C2 domains and have been implicated in ER-PM tethering, the formation of membrane contact sites, and in lipid transport and Ca2+ signaling (Giordano et al., 2013; Reinisch and De Camilli, 2016; Fernandez-Busnadiego, 2016; Herdman and Moss, 2016). Doc2B and E-Syt2 formed circular oligomeric structures on lipid monolayers analogous to those seen with Syt isoforms (Figure 1). However, we observed very few and un-stable ring-like oligomers with E-Syt1 (Figure 1). The lack of ring-like oligomers for E-Syt1 might be due to the insufficient concentration of this protein on the membrane surface as E-Syt1 has very weak affinity to the membrane under Ca2+-free conditions (Idevall-Hagren et al., 2015). The uniform dimensions of the ring oligomers of the multi-C2 domain proteins suggested that the ring is formed by a single C2 domain, with the other C2 domain(s) projecting away radially (Figure 1). This implies that the ring oligomerization is not a general property of all C2 domains, but only a select few. Consistent with this, we find that the Syt1C2B domain alone can form the ring-like oligomers albeit a bit smaller in size, but the Syt1C2A cannot (Figure 1—figure supplement 1). Brief treatment of the pre-formed ring oligomers with 1 mM Ca2+ (Figure 1—figure supplement 2) revealed that all of the Syt isoforms (Syt1, Syt2, Syt7, and Syt9) and Doc2B were sensitive to Ca2+ and are rapidly disrupted, but E-Syt were either un-affected (E-Syt2) or even stabilized (E-Syt1). Altogether, our data suggests that ring-like oligomers are a common structural feature of C2 domain containing proteins, but their sensitivity to Ca2+ is divergent (discussed below in detail). To assess the functional relevance of the Syt1 ring oligomers, we sought to understand the molecular aspects of the oligomer assembly and the Ca2+ susceptibility under physiologically-relevant conditions. The ring oligomers assembled with the minimal C2AB domain of Syt1 were highly sensitive to the ionic strength of the buffer and the anionic lipid content on the monolayer. A minimum of 35% PS in the monolayer and buffers containing <50 mM KCl were required to obtain stable ring structures (Wang et al., 2014). We reasoned that the inclusion of conserved N-terminal juxtamembrane region (~60 residues) that connects the C2AB domains to the membrane anchor, might help stabilize the ring oligomers. The juxtamembrane linker domain has been shown to be vital for Syt1 role in activating synchronous release and in clamping the spontaneous release (Caccin et al., 2015; Lee and Littleton, 2015). It also has the ability to interact with the membrane and has been shown to self-oligomerize (Fukuda et al., 2001; Lai et al., 2013; Lu et al., 2014). We purified the entire cytoplasmic domain of Syt1 (Syt1CD, residues 83–421) using a stringent purification protocol (Seven et al., 2013; Wang et al., 2014) to remove all polyacidic contaminants, which could promote non-specific aggregation of the protein (Seven et al., 2013) and this is confirmed by a single peak in the size-exclusion chromatography (Figure 2—figure supplement 1A). As expected, lipid binding analysis showed that the juxtamembrane domain enhances and stabilizes the membrane interaction of Syt1 under physiologically-relevant experimental conditions (Figure 2—figure supplement 1B). To visualize the organization of the Syt1CD on lipid monolayers under Ca2+-free conditions, we adapted the conditions used previously to obtain Syt1C2AB rings (Wang et al., 2014). Negative stain EM analysis showed that Syt1CD can form stable ring-like oligomers (Figure 2A) on monolayers under physiologically-relevant lipid (PC/PS at 3:1 molar ratio) and buffer (100 mM KCl, 1 mM free magnesium, Mg2+) composition. The outer diameter of these Syt1CD rings ranged from 19–42 nm, with an average size of 30 ± 4.5 nm (Figure 2B), analogous to the Syt1C2AB rings (Wang et al., 2014). Based on the helical indexing of the Syt1C2AB tubes (Wang et al., 2014), we estimate that this corresponds to 12–25 copies of Syt1 molcule, with average ~17 copies of Syt1. The Syt1CD rings were robust as we did not observe many collapsed ring structures, like the ‘clams’ or ‘volcanos’, routinely seen with C2AB rings (Wang et al., 2014) and were stable under a wide-range of the ionic strengths and anionic lipid content (Figure 2C). Therefore, we used the Syt1CD to delineate the mechanistic details of the Syt1 ring oligomer assembly and its Ca2+-sensitivity in a physiologically relevant environment. 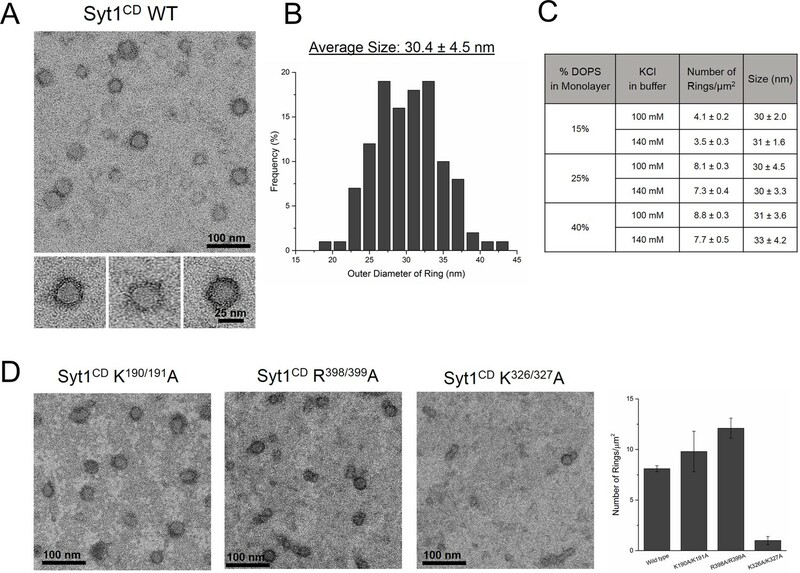 The entire cytoplasmic domain of Syt1 (Syt1CD) forms ring-like oligomers under physiologically relevant conditions. (A) Negative stain EM analysis shows ring-like oligomers of Syt1CD on PC/PS (3:1 molar ratio) lipid monolayers in buffer containing 100 mM KCl and 1 mM MgCl2. (B) The size distribution of the Syt1CD rings as measured from the outer diameter (n = ~400) under these experimental conditions using ImageJ software. (C) The Syt1CD ring-oligomers were observed under a wide-ranging conditions. Under all conditions tested, the dimension of these ring oligomers were very consistent (~30 nm), but the number of rings observed depended on amount of the anionic lipid in the monolayer and the salt (KCl) concentration of the buffer (D) EM analysis showing that the polylysine (K326/K327) motif of C2B domain is critical to the ring formation, but the other conserved polybasic regions of Syt1, namely K190/K191 on C2A and R398/R399 on C2B are not involved in ring formation. All EM analyses were carried out using 5 µM protein on monolayers containing 25% PS and in buffer containing 100 mM KCl and 1 mM free Mg2+. Representative micrographs and averages/SEM from three independent trials are shown. The assembly of the Syt1CD ring oligomers strictly required the presence of anionic lipid (PS) in the monolayer (Figure 2—figure supplement 2) and the amount of the negative charge in the monolayer and the ionic strength of the buffer affected the number and integrity of the Syt1CD rings (Figure 2C). Therefore, to identify which parts of Syt1 are involved in positioning the Syt1 on the membrane to promote the ring assembly, we focused on the conserved polybasic regions of Syt1. Disrupting the polylysine motif on the C2A (K190A, K191A) or the arginine cluster on the C2B (R398A, R399A) did not affect the ring formation (Figure 2D), but mutations of key lysine residues (K326A, K327A) within the polybasic patch on the C2B drastically reduced (~90%) the number of the Syt1CD rings, even when 25% PS was included in the monolayer (Figure 2D). This suggests that the electrostatic interaction between the polylysine motif on C2B and the anionic lipids on the membrane surface is required for the ring formation. Consequently, we tested the effect of PIP2 on the ring assembly as the polylysine motif on C2B has been shown to preferentially bind PIP2 with high affinity (Bai et al., 2004; Parisotto et al., 2012; Park et al., 2012; Honigmann et al., 2013; Krishnakumar et al., 2013; Lai et al., 2015). Syt1CD ring formation did not require PIP2, but inclusion of PIP2 in the lipid monolayer (25% PS, 3% PIP2, 72% PC) improved the number and the integrity of the Syt1CD rings (Figure 3A and E). However, PIP2 was essential to obtain stable Syt1CD ring oligomers when ATP at physiological concentrations (1 mM Mg-ATP) was included (Figure 3B,C and E). ATP is a critical co-factor, which modulates Syt1 function as it reverses the inactivating cis- interaction of Syt1 with its own membrane while preserving the functional trans- association to the plasma membrane (Park et al., 2012; Vennekate et al., 2012). This is because ATP effectively screens the interaction of Syt1 with weakly anionic PS, but not with the strong negative charges on the PIP2 head group found exclusively on the PM (Park et al., 2012, 2015). Correspondingly, lipid binding assays showed that the ATP blocks the binding of Syt1CD to PS-containing vesicles, but not to PS/PIP2 membranes (Figure 3—figure supplement 1). Corroborating this, 6% PIP2 as the sole anionic lipid (6% PIP2, 94% PC) in the lipid monolayer was found to be sufficient to form ring oligomers, even in the presence of 1 mM ATP (Figure 3D and E). Taken together, our data shows that under physiological ionic conditions, the Ca2+-independent interaction of the C2B domain with PIP2 on the PM, which has been implicated in the vesicle docking both in vitro and in vivo (Wang et al., 2011; Parisotto et al., 2012; Park et al., 2012; Honigmann et al., 2013; Lai et al., 2015), is key to assembling the Syt1 ring-like oligomers. Syt1-PIP2 interaction is key to ring-formation under physiologically relevant conditions. Similar to Syt1C2AB, Syt1CD rings were sensitive to Ca2+ and brief treatment (~10 s) with Ca2+ drastically disrupted the integrity of the preformed Syt1CD ring oligomers (Figure 4A). Calcium ions at concentrations in the range measured in intra-terminal region during synaptic transmission (Schneggenburger and Neher, 2000, 2005; Neher and Sakaba, 2008) fragmented and disassembled the rings in a Ca2+ concentration-dependent fashion (Figure 4A). PIP2 had little or no effect on the Ca2+ sensitivity of the Syt1CD as we observed very similar reduction in Syt1CD rings with or without 3% PIP2 across all Ca2+ concentration tested (Figure 4—figure supplement 1). To verify that the Ca2+ sensitivity of the Syt1CD rings is indeed due to specific Ca2+ binding to Syt1 and to map this sensitivity, we generated and tested Syt1CD mutants that disrupt Ca2+ binding to the C2A and C2B domains respectively (Shao et al., 1996). As shown in Figure 4B, disrupting Ca2+ binding to C2B (Syt1CD D309A, D363A, D365A; C2B3A) rendered the ring oligomers insensitive to calcium ions, while blocking Ca2+ binding to the C2A domain (Syt1CD D178A, D230A, D232A; C2A3A) did not alter the effect of Ca2+ on the Syt1CD rings (Figure 4—figure supplement 2). Likewise, mutations of aliphatic loop residues in the C2B domain (Syt1CD V304N, Y364N, I367N; C2B3N), which insert into the membrane following Ca2+ binding, made the Syt1CD ring oligomers insensitive to Ca2+ wash, but corresponding mutations in the C2A calcium loops (Syt1CD F231N, F234N, S235N; C2A3N) had no effect (Figure 4C, Figure 4—figure supplement 3). The mutation analysis shows that the rapid disruption of the Syt1 rings requires Ca2+ binding to the C2B and the subsequent reorientation of the C2B domain into the membrane. In other words, the dissociation of the Syt1 ring oligomers is coupled to the conformational changes in C2B domain, which is involved in Ca2+ activation and is physiologically required for triggering synaptic transmission. Ca2+ binding and subsequent re-orientation of the C2B domain into the membrane are needed to disassemble the Syt1 ring oligomer. (A) Syt1CD ring oligomers were sensitive to Ca2+ and brief treatment (10 s) of the pre-formed rings with physiological levels of Ca2+ greatly reduced the number of rings observed. (B) Ca2+sensitivity of the Syt1CD rings maps to the C2B domain as disrupting Ca2+ binding to C2B (Syt1CD D309A, D363A, D365A; C2B3A) but not C2A (Syt1CD D178A, D230A, D232A; C2A3A) rendered the rings Ca2+ insensitive. (C) Ca2+-induced insertion of just the C2B domain is necessary to disrupt the ring oligomers as hydrophilic mutation that blocks its insertion of the C2B loop (Syt1CD V304N, Y364N, I367N; C2B3N) but not the C2A loop (Syt1CD F231N, F234N, S235N; C2A3N) makes the rings insensitive to Ca2+. All EM analyses were carried out using 5 µM protein on monolayers containing 25% PS and in buffer containing 100 mM KCl and 1 mM free Mg2+. Effect of addition of 1mM Ca2+ (final concentration) is shown in (B) & (C). Representative micrographs and average values and deviations (SEM) from 3–4 independent trials are shown. In support of a functional role for the Syt1 ring-oligomers, we find that the molecular basis of the Syt1 ring oligomer assembly and its reversal are coupled to well-established mechanisms of Syt1 action. The interaction of the conserved lysine residues in the polybasic region of the C2B domain with PIP2 on the inner leaflet of the pre-synaptic plasma membrane is a key determinant in both ring assembly and in synaptic vesicle docking in vivo (Martin, 2012; Honigmann et al., 2013), suggesting these processes are mechanistically linked. In addition, Syntaxin clusters PIP2 (by binding via its basic juxtamembrane region) and it has been suggested that it is these clusters that recruit the SVs (Honigmann et al., 2013). Given the high local concentration of both PIP2 (estimated to be up to ~80 mol% in such micro-domains [Honigmann et al., 2013]) and Syt1 (anchored in the synaptic vesicles), it is easy to imagine how the ring-like oligomers could form at the docking site in between the synaptic vesicle and the PM. 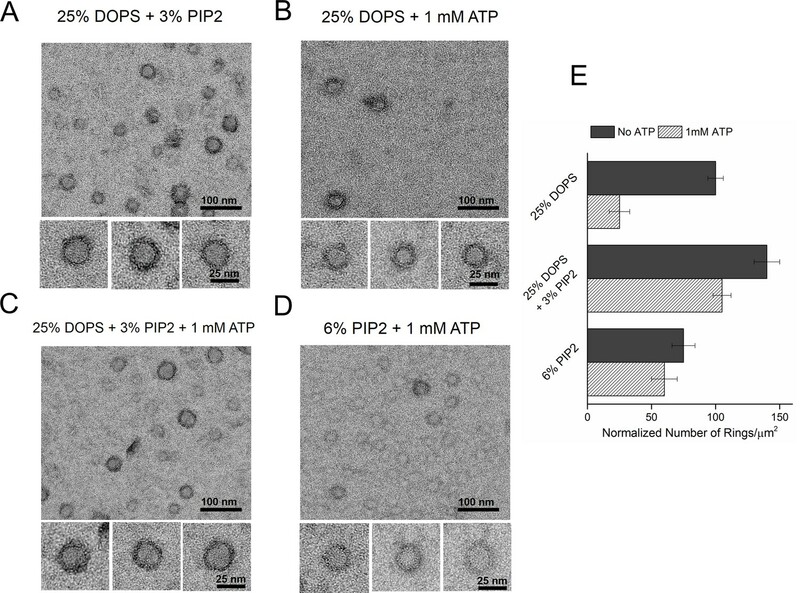 There are ~16–22 copies of Syt1 on a synaptic vesicle (Takamori et al., 2006; Wilhelm et al., 2014), enough to form a ring oligomer of ~27–37 nm in diameter, assuming no contribution from the plasma membrane pool of Syt1. This is consistent with the Syt1 ring diameters observed on the lipid monolayers (Figure 2B). Several studies have shown that the Syt1-PIP2 docking interaction precedes the engagement of the v- with t-SNAREs (van den Bogaart et al., 2011; Parisotto et al., 2012). The prior formation of a Syt1 ring would thus position it to ideally prevent the complete zippering of the SNAREs, in addition to acting as a washer (or spacer) to separate the two membranes. The height of the ring, ~4 nm (Wang et al., 2014) would allow for the N-terminal domain of the SNARE complex to assemble, but such a gap would impede complete zippering. In effect, the Syt1 rings would block SNARE-mediated fusion and hold the SNARE in a pre-fusion half-zippered state (Figure 5). This is consistent with the earlier observation that docked vesicles appear to be 3–4 nm away from plasma membrane (Fernandez-Busnadiego et al., 2011). ‘Washer’ model for the regulation of neurotransmitter release by Syt1. (A) The SV docking interaction of the Syt1 polylysine motif (blue dots) with the PIP2 (yellow dots) on the plasma membrane positions the Syt1 on the membrane to promote the ring-oligomer formation. The ring assembly might precede the engagement of the SNARE proteins. (B) Syt1 ring-oligomers assembled at the SV-PM interface act as a spacer or ‘washer’ to separate the two membranes. The height of the ring (~4 nm) would allow the partial assembly of the SNARE complex, but prevent complete zippering and thus, block fusion. NOTE: The positioning and occupancy of SNAREs on Syt1 ring is not known and are shown for illustrative purposes only. (C) Upon binding calcium ions (red dots), the Ca2+ loops that locates to the oligomeric interface, re-orients and inserts into the membrane, thus disrupting the ring oligomer to trigger fusion and release neurotransmitters. Thereby, the Syt1 ring oligomers will synchronize the release neurotransmitters to the influx of calcium ions. Besides positioning the Syt1 to promote the ring assembly, the binding of the polybasic region to the PIP2 clusters on the PM would also hold back the Ca2+ binding loops from the membrane (Figure 5). In fact, modeling of the C2AB domain onto the EM density map of the tubular structures of the Syt1C2AB suggests that the C2B calcium loops locates at the interface of the Syt1 oligomer (Figure 5—figure supplement 1). Such an arrangement would explain how the Syt1 ring could synchronize SV fusion to Ca2+ influx. Ca2+ binding to the C2B domain and subsequent conformational change, which incidentally is required to trigger neurotransmitter release (Fernández-Chacón et al., 2001; Rhee et al., 2005; Paddock et al., 2011), would induce reorientation of the C2B domain from the ring geometry and thus, break the ring oligomers. As such, this would remove the steric barrier and permit the stalled SNAREpins to complete zippering and trigger SV fusion to release neurotransmitters (Figure 5). This is congruent with the recent report (Bai et al., 2016), showing that the switch between the functional states (clamped vs. activated) of Syt1 involves large conformational change in the C2 domains. Besides membranes, Syt1 also binds to t-SNAREs and this interaction is functionally relevant for fast neurotransmitter release (de Wit et al., 2009; Mohrmann et al., 2013; Zhou et al., 2015; Wang et al., 2016). Recent reports have mapped the key t-SNARE binding interface to the C2B domain (Zhou et al., 2015), which is believed to form before the influx of Ca2+ and is maintained during Ca2+ activation process (Krishnakumar et al., 2013; Zhou et al., 2015; Wang et al., 2016). We note that in our Syt1 ring oligomer model, this binding interface on the C2B (Figure 5—figure supplement 1) is accessible and free to interact with the SNAREs. However, the occupancy and positioning of the SNARE complexes on the Syt1 ring oligomer is not known and as such, is the focus of our ongoing research. Nevertheless, it is easy to imagine that such an interaction would allow the Syt1 ring to act as a primer to organize the core components of the fusion machinery to allow for a rapid and synchronous neurotransmitter release. Further, the oligomeric structure could provide a mechanistic basis for the observed Ca2+-cooperativity in triggering SV fusion. Obviously, the ‘washer’ model is speculative and functional and physiological studies are required to ascertain its relevance. Based on our data, the key principles of the ring oligomer assembly and its Ca2+ sensitivity can be summarized as follows: The ring-oligomer formation is mediated by a single C2 domain (within multi-C2 domain protein), which binds the anionic lipids on membrane surface via the polybasic motif (Figures 1 and 2) and Ca2+ induced re-orientation of the same C2 domain away from the ring geometry disrupts the ring oligomers (Figure 4). In other words, the Ca2+ sensitivity of the ring oligomers requires the same C2 domain to have the capacity to bind both anionic lipids and Ca2+. This is true for the C2AB domains of the Syt isoforms and Doc2B and hence, these ring oligomers are Ca2+ sensitive (Figure 1—figure supplement 2). However, in the case of the E-Syts, the C-terminal C2 domains (C2E for E-Syt1 and C2C in E-Syt1) that are involved in anionic lipid dependent membrane tethering (thereby the ring formation) lack the putative Ca2+ binding loops, with the N-terminal C2 domains mediating the Ca2+-dependent membrane interaction (Giordano et al., 2013; Reinisch and De Camilli, 2016). Hence, the E-Syt rings are insensitive to Ca2+ (Figure 1—figure supplement 2). Further, E-Syt1 exhibits very weak membrane binding under Ca2+ free conditions, which is enhanced upon Ca2+ addition (Idevall-Hagren et al., 2015). The increased surface concentration of the E-Syt1 in the presence of Ca2+ could explain the improvement in the number of E-Syt1 rings observed under these conditions (Figure 1—figure supplement 2). In summary, we find that ring-like oligomers are a common structural feature of C2 domain containing proteins, not all of which are regulators of exocytosis. Particularly interesting are the E-Syts, which function to enable the ER and plasma membrane to come into intimate contact – close enough for lipids to be transferred. Our results suggest this might be achieved by bridging two membranes with an intervening structure, most probably based on ring oligomers. Such an organization could stabilize the contact sites and also enhance the lipid transfer function of E-Syts. However, more research is required to understand this better. Interestingly, yeast cells have both E-Syts (for membrane adhesion) and SNAREs (for membrane fusion) but do not contain vesicle-associated Syt protein and do not carry out calcium-regulated exocytosis. Perhaps this set the stage for exocytosis to evolve when the C2 domains combined with a vesicle-associated protein to form ring-like oligomer i.e. washers that reversibly impeded SNAREpins. The DNA constructs used in this study are the rat synaptotagmin-1 C2A and C2B domain (Syt1C2AB, residues 143–421); entire cytoplasmic domain (Syt1CD, residues 83–421); human synaptotagmin-2 C2A and C2B domain (Syt2C2AB, residues 141–419); human synaptotagmin-7 C2A and C2B domain (Syt7C2AB, residues 130–404); human synaptotagmin-9 C2A and C2B domain (Syt9C2AB residues 222–491), mouse Doc2B C2A and C2B domain (Doc2BC2AB residues 128– 412); human extended syanptotagmin-1 C2A, C2B, C2C, C2D and C2E domain (E-Syt1ABCDE, residues 315–1104), human extended syanptotagmin-2 C2A, C2B and C2C domain (E-Syt2ABC, residues 351– 893). The following mutants in Syt1CD background was created using QuikChange mutagenesis kit (Agilent Technologies, Santa Clara, CA): Ca2+-binding mutant in C2A (C2A3A, SYT1 residues 83–421 with D178A, D230A, D232A) and in C2B (C2B3A, D309A, D363A, D365A), the calcium loop insertion mutant on C2A (C2A3N, F231N, F234N, S235N) and C2B (C2B3N, V304N, Y364N, I367N), the lysine patch mutation in C2A (K190A,K191A), in C2B (K326A, K327A) and arginine patch mutation in C2B (R398A, R399A). Lipids, 1,2-dioleoyl-sn-glycero-3-phosphocholine (DOPC), and 1,2-dioleoyl-sn-glycero-3-phospho-L-serine (DOPS), phosphatidylinositol 4, 5-bisphosphate (PIP2), were purchased from Avanti Polar Lipids (Alabaster, AL). The Syt1CD wild-type and mutant proteins were expressed and purified as a His6-tagged protein using a pET28 vector, while SytC2AB isoforms and Doc2B were expressed and purified as a GST-construct. The proteins were purified as described previously (Seven et al., 2013; Wang et al., 2014), with few modifications. Briefly, Escherichia coli BL21 (DE3) expressing Sytconstructs were grown to an OD600 ~0.7–0.8, induced with 0.5 mM isopropyl β-D-1-thiogalactopyranoside (IPTG). The cells were harvested after 3 hr at 37°C and suspended in lysis buffer (25 mM HEPES, pH 7.4, 400 mM KCl, 1 mM MgCl2, 0.5 mM TCEP, 4% Triton X-100, protease inhibitors). The samples were lysed using cell disrupter, and the lysate was supplemented with 0.1% polyethylimine before being clarified by centrifugation (100,000 ×g for 30 min). The supernatant was loaded onto Ni-NTA (Qiagen, Valencia, CA), or Glutathione-Sepharose (Thermo Fisher Scientific , Grant Island, NY) beads (3 hr or overnight at 4°C) and the beads was washed with 20 ml of lysis buffer, followed by 20 ml of 25 mM HEPES, 400 mM KCl buffer containing with 2 mM ATP, 10 mM MgSO4, 0.5 mM TCEP. Subsequently, the beads were resuspended in 5 ml of lysis buffer supplemented with 10 μg/mL DNaseI, 10 μg/mL RNaseA, and 10 μl of benzonase (2000 units) and incubated at room temperature for 1 hr, followed by quick rinse with 10 ml of high salt buffer (25 mM HEPES, 1.1 M KCl, 0.5 mM TCEP) to remove the nucleotide contamination. The beads were then washed with 20 ml of HEPES, 400 mM KCl buffer containing 0.5 mM EGTA to remove any trace calcium ions. The proteins were eluted off the affinity beads in 25 mM HEPES, 100 mM KCl, 0.5 mM TCEP buffer, either with 250 mM Imidazole (His-tag proteins) or using Precission protease for GST-tagged constructs and further purified by anionic exchange (Mono-S) chromatography. Size-exclusion chromatography (Superdex75 10/300 GL) showed a single elution peak (~12 mL) consistent with a pure protein, devoid of any contaminants. In all cases, the protein concentration was estimated using Bradford assay with BSA as standard and the nucleotide contamination was tracked using the 260 nm/280 nm ratios. The protein was flash frozen and stored at −80°C with 10% glycerol (20% glycerol for Syt1CD) without significant loss of ring-forming activity. To form the lipid monolayer, degased ultrapure H2O was injected through a side port to fill up wells (4 mm diameter, 0.3 mm depth) in a Teflon block. The surface of the droplet was coated with 0.5 μl of phospholipid mixture (0.5 mM total lipids). The lipid mixtures, DOPC/DOPS & DOPPC/DOPS/PIP2 were pre-mixed as required, dried under N2 gas and then re-suspended in chloroform to the requisite concentration before adding to the water droplet. The Teflon block then was sealed in a humidity chamber for 1 hr at room temperature to allow the chloroform to evaporate. Continuous carbon-coated EM grids (400 mesh; Ted Pella Inc., Redding, CA ) were baked at 70°C for 1 hr and washed with hexane to improve hydrophobicity. Lipid monolayers formed at the air/water interface were then recovered by placing the pre-treated EM grid carbon side down on top of each water droplet for 1 min. The grid was raised above the surface of the Teflon block by injecting ultrapure H2O into the side port and then was lifted off the droplet immediately. Proteins were rapidly diluted to 5 μM in 20 mM MOPS, pH 7.5, 5 mM KCl, 1 mM EDTA, 2 mM MgAC2, 1 mM DTT, 5% (wt/vol) trehalose buffer and then added to the lipid monolayer on the grid and incubated in a 37°C humidity chamber for 1 min. The final KCl concentration in the buffer were adjusted to 100 mM or 140 mM as required. To facilitate structural analysis of the rings, we further optimized the incubation conditions by using an annealing procedure: Rings were nucleated at 37°C for 1 min followed by a 30-min annealing step at 4°C. The grids were rinsed briefly (∼10 s) with incubation buffer alone or with buffer supplemented with CaCl2 (0.1, 0.5 and 1 mM free) for Ca2+ treatment studies. The free [Ca2+] was calculated by Maxchelator (maxchelator.stanford. edu). Subsequently, the grids were blotted with Whatman#1 filter paper (Sigma-Aldrich, St. Louis, MO), negatively stained with uranyl acetate solution (1% wt/vol), and air dried. The negatively stained specimens were examined on a FEI Tecani T12 operated at 120 kV. The defocus range used for our data was 0.6–2.0 μm. Images were recorded under low-dose conditions (∼20 e−/Å2) on a 4K × 4K CCD camera (UltraScan 4000; Gatan, Inc., Pleasanton, CA), at a nominal magnification of 42,000×. Micrographs were binned by a factor of 2 at a final sampling of 5.6 Å per pixel on the object scale. The image analysis, including size distribution measurements was carried out using ImageJ software. Journal of Biological Chemistry 276:40319–40325. Nature Structural & Molecular Biology 20:679–686. Nature Structural & Molecular Biology 18:934–940. Nature Structural & Molecular Biology 18:927–933. Journal of Biological Chemistry 289:22161–22171. Journal of Biological Chemistry 287:31041–31049. Nature Structural & Molecular Biology 19:991–997. Biochimica Et Biophysica Acta 1861:924–927. Annual Review of Biophysics 44:339–367. Nature Structural & Molecular Biology 18:805–812. The Journal of Cell Biology 195:1159–1170. Thank you for submitting your article "Ring-like Oligomers of Synaptotagmins and Related Proteins" for consideration by eLife. Your article has been reviewed by three peer reviewers, and the evaluation has been overseen by a Reviewing Editor and Randy Schekman as the Senior Editor. One of the two reviewers has agreed to reveal his identity: Edwin R Chapman (Reviewer #2). This work extends a previous study (Wang et al. 2014, PNAS) on ring-like structures of synaptotagmin 1 on a monolayer. The most interesting point throughout the work is that the ring-formation ability seems to be shared for some, but not all, C2 domain-bearing proteins involved in membrane traffic, including certain E-Syts. However, there are several concerns that need to be addressed before a final decision can be made. 1) It is interesting that Syt1 C2AB/C2B could form ring-like oligomers in the presence of acidic lipids-bearing monolayer. However, it is unclear whether the C2 domain could self-assemble to oligomers in solution (i.e. in the absence of membrane), especially for Syt1CD (residues 82-421). As the authors mentioned, the Syt1CD is prone to aggregate (Fukuda et al. 2001, Lai et al. 2013, Lu et al. 2014) into oligomers. Note that Seven et al. 2015, PNAS suggest that the aggregation might due to impurity of the protein. Although this work used a developed method to purify the Syt1CD, the elution profile of Syt1CD (with or without Mg2+ ions and calcium, also the other C2 domain proteins) on SEC should be provided. 2) Stable Syt1CD ring oligomers were observed on membranes (with PIP2) in the presence of Mg2+, ATP and 100 mM KCl (Figure 3). Do Syt1 C2AB and/or C2B behave similarly in this condition? 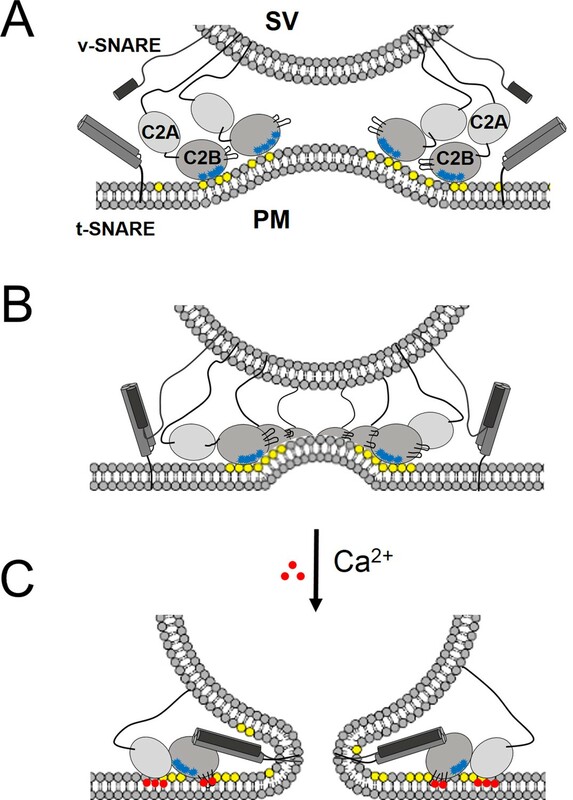 In the proposed model (Figure 5—figure supplement 1), Syt1 associates with each other via C2B-C2B binding interface but not via the juxtamembrane region that connects C2A and the transmembrane domain. 3) In Figure 1, the authors presented that a wide range of C2 domain-bearing proteins are able to form ring structures. However, in physiological conditions, some of these proteins may coexist in the same compartment (e.g. Syt1, Syt7 and Doc2). As the authors mentioned, these three proteins mediate different modes of neurotransmitter release separately and all can form similar ring structures. Can different C2 domains form hetero-oligomeric rings? 4) As shown in Figure 1 and Figure 1—figure supplement 2, E-Syt1 displayed very few and unstable ring structures in the absence of calcium, and surprisingly, such structures can be stabilized in the presence of calcium. This result is conflict with those observed for Syt1, 2, 7, 9 and Doc2B, suggesting E-Syt1 or 2 uses a different mechanism to form ring-like oligomers. 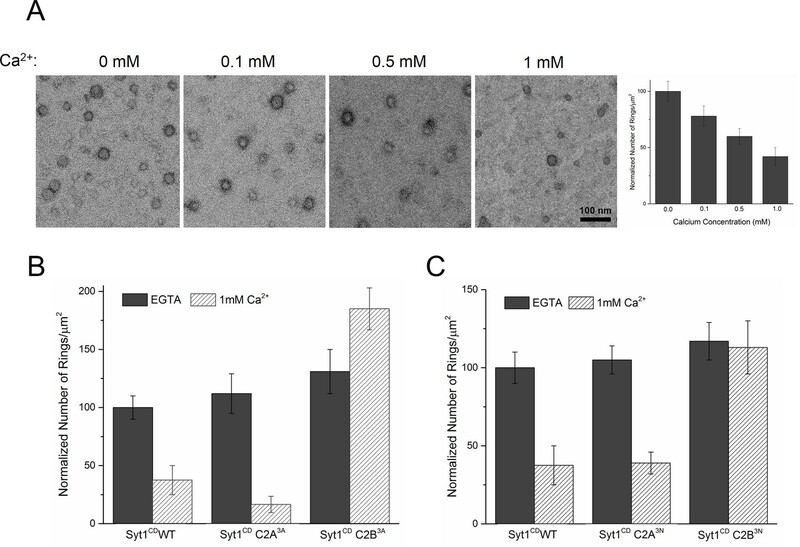 Instead, the authors attributed these differences to 1): "The lack of ring-like oligomers for E-Syt1 might be due to the insufficient concentration of this protein on the membrane surface as E-Syt1 has very weak affinity to the membrane under calcium-free conditions (Idevall-Hagren et al. 2015)"; 2) the sensitivity to calcium is divergent between Syts/Doc2B and E-Syts; and "in fact, calcium improved the number of rings observed with E-Syt1 consistent with the fact effective membrane interaction of E-Syt1 requires calcium” (Figure 1—figure supplement 2 legend). However, how can one explain that calcium disrupted the number of rings observed with Syts and Doc2B considering that their binding to membrane is effective in the presence of calcium? The authors should check whether E-Syt1 bind to PS/PIP2 via the conserved polybasic region, and whether the binding of E-Syt1 to membranes is sensitivity to calcium. 5) In Figure 4 and Figure 4—figure supplement 1, the ring structures were disrupted after calcium addition. However, previous works show that there is a synergy between Syt1 (K326, K327)- PIP2 interaction and Syt1 (calcium-binding loops)-PS interaction (van den Bogaart et al. 2012, JBC). Moreover, the interaction between polybasic stretch (K326, K327) of Syt1 C2B and PIP2 has been reported not to be disrupted during calcium addition in the presence of t-SNARE/cis-SNARE complex (Wang et al. 2016, eLife). It is sometimes possible that the negative stain process affects the sample. Therefore, it is essential to reproduce the results with cryo-EM for samples treated by calcium in a short time before vitrification, to confirm whether Syt1 proteins stand around the disappearing ring structures similar to that observed with Syt2 in negative stain (Figure 1—figure supplement 2). 6) In the Discussion, the authors mentioned that "However, the molecular details of this interaction remains unclear, specifically due to the promiscuity and the low affinity of the Syt1/t-SNARE interaction". In recent work (Wang et al. 2016, eLife), it has been shown that the disassociation constant (Kd) between Syt1 and SNARE complex is about 1 μM in the presence of acidic membrane, compared to a large value obtained in the absence of membrane. The authors should cite this when discuss the functional relevant issues between Syt1 and t-SNARE. 7) Zhou et al. (Nature, 2015), showed that one of the interfaces between the synaptogtamin C2B domain and the SNARE complex is essential for fast neurotransmitter release and forms prior to calcium injection. Are the proposed models of Syt1 oligomers compatible with this finding? The authors are kindly encouraged to provide a balanced discussion of the recent findings by Wang et al., 2016 and Zhou et al. 2015 and discuss their models in the context of these recent findings. 8) The ring-oligomers formed by the E-Syts were not disrupted by calcium what are the implications? 9) In the legend for Figure 1—figure supplement 2, the authors mention that: "In fact, calcium improved the number of rings observed with E-Syt1 consistent with the fact effective membrane interaction of E-Syt1 requires calcium (Ref)." It is unclear as to what is meant here, since calcium stimulates the binding of Syts and Doc2 to membranes, as well. 10) It is unclear how many syt molecules are required to form the ring-like oligomers: 15? More than 15? What is the variation? What is the relevance to the copy number of syt1 per synaptic vesicle? The number of syt1 molecules per vesicle should be discussed, and (Takamori et al. 2006) cited. If it the required number is more than 15, it is highly unlikely that such rings form in vivo considering the protein number in synaptic vesicles. Moreover, given the physical constraints in the system (length of the linker that connects the C2-domains to the SV membrane etc. ), more through and balanced discussion over whether syt1 can physically form these structures is required. 11) Given the physical constraints in vivo (e.g. membrane tethers, the diameter of synaptic vesicles etc. ), can these rings form in vivo? And it might be wise to reexamine how the SNARE fit in, as they would seem to fit INSIDE these very large rings? 12) A large conformational switch in syt1 was recently reported (e.g. Bai et al., 2016), and this report seems congruent with the model put forward in the current study, so this paper should be discussed and cited. 13) Complexin as a fusion clamp – the new review from Trimbuch & Rosenmund (2016) should be cited, as there is strong evidence complexin is not a clamp in murine neurons. 14) The observation of E-Syt rings is very interesting. The lipid transfer activities of E-Syts remain intact when their C2 domains are replaced by those of Syt-1, consistent with the authors' model. However, the lipid-harboring synaptotagmin-like-mitochondrial-lipid binding protein (SMP) domains were not included in this study. Are these SMP domains compatible with the configuration of the ring if they all face inside? 15) Does PIP2 influence the ring-forming properties of other C2 domain molecules such as Doc2b and E-Syts? 16) The authors propose that the E-Syt rings prevent membrane fusion at ER-PM contact sites. This seems unlikely because membrane fusion is not a spontaneous process that needs to be "prevented". Instead, the ER-PM contact sites may simply lack the membrane fusion machinery. In support of this notion, lipid transfer also occurs at other membrane contact sites where no C2 domain molecules are found. These concepts need to be addressed by the authors. 17) Generally, the results with E-Syt are among the most interesting new results in this paper, but yet the discussion almost exclusively focuses on Syt1 (which is more controversial in view of the copy number in synaptic vesicles and other concerns raised in the above points). Thus, the authors are kindly asked to expand the discussion of the E-Syt results and their biological implications. 18) As Honigmann et al. 2013, NSMB and van den Bogaart et al. 2011, Nature reported, PIP2 displays a roughly 73 nm-sized microdomains in company with syntaxin-1a. In this work, however, there is no syntaxin reconstituted on monolayer. It is conceivable that Syt1 binds preferentially to PIP2 rather than other acidic lipids (e.g. PS) in the absence of Ca2+. How can the ~30 nm-sized ring structure be stabilized? What is the morphology of the ring structure in the presence of syntaxin and PIP2 without calcium? 19) Are the ring-like structures of Syt-1 affected by complexin and/or t-SNAREs (e.g., anchored to monolayers through Nickel-His6 interactions)? As highlighted by the reviewer, we have used a stringent purification protocol to remove all polyacidic (nucleotide) contaminants, which could promote protein aggregation. This involved benzonase/ DNAse/ RNAse treatment, high salt (1.1 M KCl) wash and final purification on an ion exchange (Mono-S) column. The 260/280 ratio for all Syt1CD samples after Mono-S purification were <0.55, confirming the purity of samples (NOTE: 260/280 ratio of 0.57 or less indicates no nucleotide contamination). Few selected samples, we further tested by size-exclusion chromatography (Superdex-75 column), which showed a single elution peak (~12 mL) consistent with a pure protein, devoid of any contaminants. As suggested by the reviewer, we now cite Seven et al. (Seven et al. 2013) and discuss the contaminant issue in detail in the Results (subsection “Complete Cytoplasmic Domain of Syt1 forms Rings under Physiologically Relevant Conditions”, last paragraph) and Methods (subsection “Protein Expression and Purification”, first paragraph) and also included the SEC profile (Figure 2—figure supplement 1). We tested the C2AB domain of the other Syt isoforms and Doc2B (i.e. without the juxtamembrane linker domain) and the aggregation is not a problem typically associated with the C2AB domain alone. Nevertheless, we employed the stringent method to purify the proteins. Thus, we believe that the oligomerization we have described on the lipid monolayers is an intrinsic and conserved feature of the C2 domain and not an aggregation triggered by impurities in the sample. Syt1C2AB does form ring-like structures under more physiological conditions, but the prevalence and stability of the ring structures are drastically reduced (Wang et al. 2014. Figure S2). This, we beleive, is mainly due to the low concentration of the protein on the lipid monolayer surface under these conditions as we can increase the number of rings by increasing the negative lipid content on the monolayer and/or by lowering the salt concentration in the buffer to minimize the electrostatic screening effect. Lipid binding analysis (Figure 2—figure supplement 1B) shows that the juxtamembrane linker domain indeed enhances and stabilizes the Syt1 membrane interaction under physiological conditions. Thus, inclusion of the juxtamembrane linker domain increases the surface concentration of Syt1 under these experimental conditions and thereby the prevalence of the ring oligomers. This data is now included in the revised manuscript (Figure 2—figure supplement 1B) and referred in the Results section (subsection “Complete Cytoplasmic Domain of Syt1 forms Rings under Physiologically Relevant Conditions”, last paragraph). Our data suggests that the circular oligomerization is an intrinsic property of the certain C2 domains, including many Syt isoforms and Doc2B. However, we have not explicitly tested the ability of the different isoform to form hetero-oligomeric ring structures. This is a very interesting possibility, with wide-ranging implication and will be focus of our future work and as such, is beyond the scope of the current work. We had previously confirmed using cryo-EM (Wang et al.2014 Figure S3) that the negative stain process does not affect the Syt1 ring formation or its Ca2+ sensitivity (Wanget al. 2014). Further, we have shown that the disruption of the Syt1 ring was reversed when Ca2+ was chelated with EDTA (Wang et al.2014 Figure S8) confirming that the Syt1 proteins are still bound to the membrane following Ca2+ treatment. Reversible oligomerization might be critical to C2 domain protein functioning in calcium-triggered exocytosis, but not relevant for E-Syts function in maintaining the ER-PM appositions. We suppose that the ring-like oligomerization might stabilize the ER-PM contact sites and aid in the lipid transfer function of E-Syts. As such, Ca2+ insensitivity might allow the E-Syts to either maintain (E-Syt2) or even enhance (E-Syt1) its function upon Ca2+ influx. This is consistent with the functional role of E-Syts. However, more research is needed to address this in detail. Based on the helical indexing of the Syt1C2AB decorated tubes (Wang et al. Figure 3), we estimate that the Syt1 ring with average outer diameter of ~ 30 nm corresponds to ~ 17 copies of Syt1 molecules. NOTE: Syt1CD does not assemble in tubular structures and thus, we are unable to perform similar reconstruction with Syt1CD ring oligomers. However, the rings assembled with Syt1CD and Syt1C2AB are remarkably similar and thus, the Syt1C2AB tubes provide a very close approximation for the quantitative analysis. 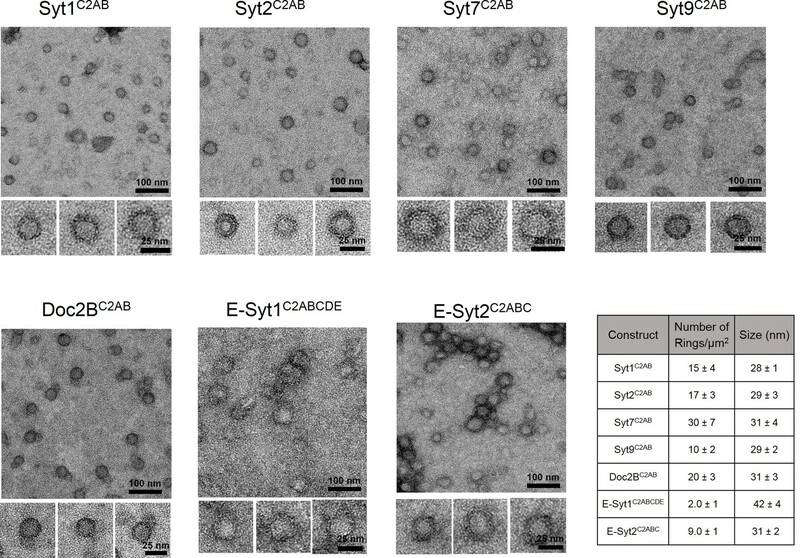 A synaptic vesicle contains ~16-22 copies of Syt1 molecules (Takamoriet al. 2006, Wilhelmet al. 2014), enough to form a ring oligomer of ~27 -37 nm in diameter, consistent with our EM analysis. Therefore, we believe that the rings of average diameters observed in our EM analysis can form at the SV-PM interface in vivo. We have now included the quantitative analysis in the Results (subsection “Complete Cytoplasmic Domain of Syt1 forms Rings under Physiologically Relevant Conditions”) and in the Discussion section (first paragraph). Our data indicates that the Syt1 rings can assemble under physiological ionic strength and membrane composition. Given the length/flexibility of the juxtamembrane linker region, it should not affect the C2 ring formation, even when anchored in the synaptic vesicle. In fact, mathematical modeling faithfully reproduces the Syt1 oligomerization at the vesicle-plasma membrane interface under physiological conditions considering the vesicle dimension and the physical constraints, in support of the ‘washer’ model. A manuscript describing these findings is currently under preparation (Zhu, O’Shaughnessy & Rothman). In Figure 5, the SNARE protein are shown outside the Syt1 rings (with no interaction) for illustrative purpose only to highlight that the height of ring would prevent the complete zippering of SNAREs. The occupancy and the orientation of the SNAREs on the Syt1 rings is not known and as such, focus of our current work. We have now included the following statement “The positioning and occupancy of SNAREs on Syt1 ring is not known and are shown for illustrative purposes only” (Figure 5 legend) to clarify the issue. We favor the SNARE assembling outside of the Syt1 rings in the ‘washer model’ for the following reasons: 1) The inner dimensions of the Syt1 ring (~20 nm) could fit a small number of SNAREs, but not the multiple SNARE complexes (high copy number) that are needed for ultra-fast, evoked neurotransmitter release (Acuna et al. 2014). 2) Complexin is required for normal Ca2+ triggered release and biochemical/structural studies (Krishnakumaret al. 2011, Kummelet al. 2011) suggests that Complexin functions by organizing the pre-fusion SNARE complexes into a zig-zag array via trans interaction. It is not feasible to fit the inter-connected array of SNAREs inside the Syt1 rings. 3) Also, if the SNAREs were to zipper outside the Syt1 rings, then ring oligomers function as a ‘washer’ or spacer more effectively to impede the SNARE assembly and thus, synchronize fusion to Ca2+ influx. This reference has now been included and cited (Introduction, third paragraph). The SMP domain are connected to the C2 domains via a flexible linker, that is believed to be long enough to allow them shuttle between the ER and PM for lipid transfer (Schauderet al. 2014, Reinisch and De Camilli 2015). So, the SMP domains can locate outside of the E-Syt ring i.e. positioning of the SMP domain is not limited by the size of the E-Syt rings. X-ray structure of E-Syt2 shows that the SMP domain self-dimerize, however it is not clear if the in vivo functional form is a dimer, as other TULIP domain could function as a monomer (Reinisch and De Camilli 2015). Nevertheless, the dimension of the SMP dimer (~9 nm) (Schauderet al. 2014) should fit within the inner diameter of the E-Syt rings (~20 nm). We require additional studies including SMP domain to understand how its influences the C2 domain organization, and how the oligomerization would affect its function. The ring assembly of Syt1 is triggered by the binding of the polylysine motif of the C2B domain to the anionic lipid on the lipid surface. Under the right condition, the identity of the anionic lipid does not appear to be a critical factor as we observe Syt1 rings on monolayers containing PS alone or PIP2 alone. However, under physiologically relevant conditions, the interaction with PS will be limited and thus, PIP2 will be a critical factor. We believe that this will be true for other C2 domain molecules such as Doc2B and E-Syts. We limited our analysis with PIP2 containing monolayers to Syt1 due to the technical challenges involved in forming stable PIP2 containing monolayers on the EM grids. We share the reviewer’s enthusiasm on the commonality of the ring oligomers of C2 domain protein, in particular with distantly related proteins like E-Syts and intrigued by its implication on the organization and function of E-Syts. As described in Point 14, the ring oligomers are compatible with SMP domain, a key functional element of the E-Syts, which are believed to self-dimerize (Schauderet al. 2014). However, more research, particularly with constructs which include the SMP domain, is required to address this adequately. We have thus limited our discussion on E-Syts, but rather focused on Syt1 for which we have ample data to support a functionally relevant role. We are confident that we addressed many of the concerns raised by the reviewers, particularly on the synaptic vesicle copy number, in the revised manuscript. Nevertheless, we have now expanded the discussion on the Ca2+ sensitivity of the E-Syts and refer to possible role of ring oligomers at ER-PM junctions in the Discussion section (fourth paragraph). Under physiological conditions, the Syt1-PIP2 interaction mediated via the polybasic motif positions the C2B domains on the membrane and facilitates the circular oligomerization of the Syt1 molecule. Modeling studies (Figure 5—figure supplement 1) shows that this involves spatial organization of the C2B domain with the Ca2+-binding loops locating at the interface. We currently do not have high resolution structure to identify the molecular contact that stabilize the ring oligomers. Recent report (Wanget al. 2016) shows that Syt1 can bind PIP2 and t-SNARE simultaneously and our reconstruction shows that the primary t-SNARE binding site (marked as R398/R399 and shown in green in Figure 5—figure supplement 1) as identified in Zhou et al.Nature 2015 is available for interaction. So, we concur that the binding SNARE complex (via t-SNAREs) or Complexin should not interfere with the ring assembly. However, additional research is required to be certain. We thank Dr. Pietro De Camilli for helpful discussions and critical reading of the manuscript. We also wish to thank Dr. Kirill Volynski and Dr. Sarah Auclair for critical reading of the manuscript. This work was supported by National Institute of Health grant GM071458 to JER. © 2016, Zanetti et al. Previously, we showed that synaptotagmin1 (Syt1) forms Ca2+-sensitive ring-like oligomers on membranes containing acidic lipids and proposed a potential role in regulating neurotransmitter release (Zanetti et al., 2016). Here, we report that Syt1 assembles into similar ring-like oligomers in solution when triggered by naturally occurring polyphosphates (PIP2 and ATP) and magnesium ions (Mg2+). These soluble Syt1 rings were observed by electron microscopy and independently demonstrated and quantified using fluorescence correlation spectroscopy. Oligomerization is triggered when polyphosphates bind to the polylysine patch in C2B domain and is stabilized by Mg2+, which neutralizes the Ca2+-binding aspartic acids that likely contribute to the C2B interface in the oligomer. Overall, our data show that ring-like polymerization is an intrinsic property of Syt1 with reasonable affinity that can be triggered by the vesicle docking C2B-PIP2 interaction and raise the possibility that Syt1 rings could pre-form on the synaptic vesicle to facilitate docking.